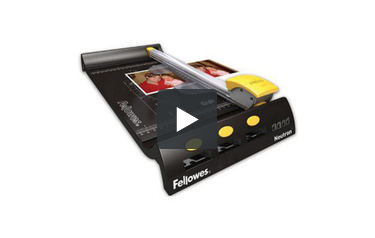 The Fellowes Neutron Rotary Paper trimmer is designed for personal and home use and can cut up to 10 sheets of 20lb paper at a time. This 12 inch rotary cutter uses Fellowes patented SafeCut blade cartridges to help keep users safe by preventing contact with the cutting blade. Plus, it offers a quick change blade system that helps to ensure fast, easy blade cartridge removal or insertion. The base for the Fellowes Neutron trimmer includes an integrated SafeCut cartridge storage compartment for an extra blade or to store your blade when you are transporting the trimmer. The Fellowes Neutron even includes a variable paper clamp to help ensure cutting precision and cutting guides for various sizes of paper, photos or angle cuts. Enclosed SafeCut stainless steel rotary blade ensures user safety. Cuts up to 10 sheets (20lb paper) at one time. Convenient SafeCut blade cartridges are interchangeable for increased design flexibility. Base with unique integrated SafeCut™ cartridge storage compartment. Variable paper clamp ensures cutting precision. Carry handle for portable ease. Excellent product, there was slots to store other blades but they didn't come with it. I'm finding it hard to get them. Welcome to MyBinding video. This is the Fellowes Neutron, a 12-inch rotary paper trimmer. Very stylish and easy to use, the Neutron is a great little trimmer for the home or small office. It's silent and steady and very safe. With a 12-inch base and cutting pad, all standard sized papers are no problem. The cutting capacity of this trimmer is ten sheets of 20lb paper, but you may need to run it back and forth a couple of times. That's the joy and ease of a rotary trimmer. Laminated projects pose no problem. The Neutron trimmer uses Fellowes SafeCut cartridges. They're very safe because you cannot make contact with the blade. And they also store right here into the front of the machine. And interchanging is a simple as lifting the lid and placing a new one in. The unit comes standard with a straight blade. The Fellowes blade kit comes with a wave, perforating, and scoring blade, all of them interchangeable in seconds and stored right in the slots on the unit itself. After sometime, the cutting mat will wear out and replacement is as simple as you see here: simply pull out the old one, trim the new one to match the old one, and place it right back in. There it is, the Fellowes Neutron Rotary Trimmer. For more demos, reviews, and how-tos, check out MyBinding.com. Cutting straight lines is easy when you have a rotary trimmer. If you're in need of one, you should take a look at the Fellowes Neutron. Here's what you need to know about it to decide if it's what you need. This is a good device to use if you need to trim letter-sized documents that measure 8.5" x 11". The Neutron has a 12-inch cutting length so it's perfect for the most common size of documents, as well as smaller ones. It can even trim photographs. The cutting capacity of this device isn't on par with a guillotine or stack cutter, but for a rotary trimmer, it's pretty good. It can cut up to 10 sheets of 20 lb bond paper at once, which should be good enough for occasional use. This device is safe to use because it utilizes Fellowes' SafeCut blade cartridges. These cartridges enclose the blade in plastic casing so that you'll be able to cut the paper and not your fingers. The blades are very easy to change and swapping them out only takes a few seconds so you'll be able to save some time. You can even store an extra SafeCut blade in the base of the trimmer for easy access. To keep your documents in place as you cut, the Neutron has an integrated paper clamp. You can move the clamp around so that it will work with the size of your items. This trimmer's based has a number of cutting guides printed on it so you'll be able to trim just the right amount of off of your paper. It even has a protractor printed on it which can help make angled cuts a little bit easier to accomplish. The Neutron will take up some room on your work surface but unless your desk is very small, it should take up the entire thing. This trimmer has dimensions of approximately 3" (height) x 8.5" (width) x 19" (length). It would be possible to transport this device easily because it weighs less than 3 pounds. Fellowes is a great name to look for when purchasing office devices, especially when it comes to rotary trimmers like the Neutron. This device is built very well and it comes with a 10-year warranty, so you'll be able to get a lot of use out and get it repaired or replacement if the needs arises. Plus, this trimmer is very affordable. It will cost you less than $50.00. Recommendation: Overall, the Fellowes Neutron is a great rotary paper trimmer for occasional use and the trimming of letter-sized documents. It would be good for home and office use, but you'll need to make sure the cutting length and capacity works for you. Ten sheets is a good amount for this type of device, but it won't cut it (no pun intended) if you need to process a lot of paper quickly or if you work with large items. However, if these limitations are fine with you, this trimmer might be a good fit, so take a look at it today.